Journal of Machine to Machine Communications, Vol. 1, 51–68. Applications of Ultrasound in examining physical health of patient are continuously expanding over last few decades. Ultrasound imaging has assisted doctors in the diagnosis of medical health of patient in obstetrics, cardiology, gynaecology, musculoskeletal, urology and others. It has proved to be very promising and considerably advantageous over other imaging methods because of its features like non-invasive nature, use of non-ionizing radiation, portability, rapidity in performance, ease and cheap availability, real time imaging capability, high patient acceptability. Despite many advantages, it suffers from Speckle noise which results in affecting image resolution and contrast making an adverse impact on the diagnostic capability of the imaging modality. In this paper, we attempt to remove speckle noise from musculoskeletal ultrasound image for shoulder application using Anisotropic Diffusion and Non-Local Means (NLM) method. The quantitative analysis of the result is done using measurement indexes such as peak signal to noise ratio (PSNR), signal to noise ratio (SNR) and root mean square error (RMSE), whereas, visual inspection is carried out for qualitative analysis. Ultrasound imaging has assisted radiologist and physicians in observing anatomy of human body since past few decades. Ultrasound was developed during the Second World War and since then is assisting for various applications on water, air and earth in various forms. Ultrasound as a medical imaging modality evolved about half a century ago and considered to be great invention because of its unique and advantageous features over all other existing medical imaging modalities. It offers several superior features such as use of non-ionizing radiation, real time imaging, portability, high patient acceptability, ease of use and is economical. Despite many advantages, ultrasound images contain noise known as `Speckle' which corrupts the image resolution and contrast making interpretation of physical structure lying underneath, extremely difficult for physicians. Various phenomena like image acquisition and imperfections in machine design contribute to the existing resolution and contrast in ultrasound images. Despeckling of ultrasound images is considered to be of utmost important to make it a viable and suitable option for use as imaging modality. As a result, several efforts have been made by research community to despeckle the image as well as to improve the system design to help diagnostics. Speckle noise in ultrasound image is introduced because of the coherence nature of imaging modality, the interference of back scattered signals from each resolution and sub-resolution cell towards receiver or transducer. The backscattered waves undergo constructive or destructive interference in a random manner spoiling image in a random granular pattern, termed as Speckle. Due to the acquisition process the speckle noise in ultrasound is multiplicative in nature which is directly proportional to grey level in any area and is statistically independent from signal. The statistics of the speckle noise was first proposed by Goodman , where he modeled the statistical representation of speckle formation in laser. With study about statistical features in ultrasound imaging it was concluded that speckle in ultrasound images is multiplicative in nature following a different statistical distribution , , ,  naming Rayleigh, Rician, Nakagami, K- distribution depending on the scatterer density and scatterer size of the tissue being imaged. Noise in ultrasound images introduced has both multiplicative as well as additive nature making it more difficult to separate signals and denoise image. The multiplicative noise introduced due to the coherency feature whereas additive noise comes from the system properties. In the past few decades, efforts have been made to post process ultrasound images taken from system and remove noise from ultrasound images for better interpretation and diagnosis. In this paper we have discussed in detail comparison about two despeckling method 1) Anisotropic diffusion method 2) Non Local Means Method. Anisotropic Diffusion Method , ,  is successfully used to remove speckle noise from ultrasound images, whereas nonlocal means method  initially used for additive noise is recently introduced to despeckle ultrasound images . The qualitative and quantitative comparison for two methods is also provided. where, g, f, u and ξ are observed envelope image, original image, multiplicative noise and additive components respectively. The model has been successfully used both in Synthetic Aperture Radar as well as Ultrasound Imaging. where, g(x) is the observed signal, x is the original signal without noise, u is the noise which is dependent of the observed signal. The paper focuses on the B-Scan images taken from ultrasound machine focusing musculoskeletal application for shoulder images. In section (II), a brief discussion on the speckle reduction methods is provided combined with detail discussion for anisotropic diffusion and non-local means method, followed by, the description of materials and methods in section (III), discussion and conclusion about the findings are shown and summarized in section (IV) and section (V) respectively. Speckle degrades information in the image and that too, to the extent, that it becomes difficult for medical practitioner to form a comprehensive understanding of tissues or bones for proper diagnosis. Several researchers have studied this phenomena and attempted to improve the quality of images using different denoising methods like, mean filter, median filter, adaptive mean filters such as Kuan  and Lee , both filter have same characteristic and operate by computing the different combination of coefficient of variation of noised image and coefficient of variation of noise, in general operates on center pixel intensity and average pixel intensity of filter window, where filter forms a balance between averaging image in homogeneous region and applying identity filter elsewhere. Frost , this filter also works on principle of averaging homogeneous region and all pass filter in other non-homogeneous sections. The difference lies in filter window which in this case is an exponentially shaped kernel that can form average filter or all pass filter on an adaptive basis. The response of the filter varies again with the coefficient of variation of noise and coefficient of variation of noised image. Wavelet based speckle reduction methods are classified into Homomorphic and Non-Homomorphic wavelet filtering. In homomorphic method , ,  multiplicative noise in ultrasound image is converted into additive noise by taking logarithmic transform in first step, followed by wavelet decomposition and modification of wavelet coefficients in second step, then inverse wavelet and exponential transform is performed to get back the reconstructed image. Whereas in non-homomorphic method ,  it is considered that converting the multiplicative noise to additive noise results in loss of many statistical properties of the image and inappropriate performance of despeckling method , therefore in this method despeckling is performed without taking into account any noise model and the method can adapt itself to many different noise models present in medical images. In , we have analyzed ultrasound images using wavelets decomposition up to second level and performed qualitative as well as quantitative analysis using different measurement indexes. Total variation denoising method is used to remove noise from an image model by solving minimization problem. The noise model for ultrasound image is formed and based on noise model regularization term and data fidelity terms are defined so as to despeckle the image. In ,  the minimization problem is solved using novel Split- Bregman algorithm based on Zhang-Burger-Bresson-Osher's non local graph method. The detailed discussion for anisotropic diffusion and Nonlocal means method is given in following section. where k (set either manually or using noise estimator) is the parameter controlling the level of diffusion between edges and homogeneous region in images, optimum value should be chosen to avoid over or under smoothing. If x >> k, then c(x)0, we use all-pass filter, where as if x << k, then c(x)1, we use isotropic diffusion (Gaussian filtering). It is also suggested by , that anisotropic diffusion discussed above works well for additive noise where as in the presence of speckle noise, instead of delineating the image enhances speckle. The function q(x,y;t), instantaneous coefficient of variation combines normalized Laplacian operator and normalized gradient operator to detect edges from the speckled images. At the edges, Laplacian term shows zero crossing whereas gradient gives higher values allowing detection of edges in bright as well as dark regions. The function takes higher values at edges or high contrast regions, whereas, low values in homogeneous regions. where, P(x) denotes the square patch centered around pixel x, h is filtering parameter and ‖•‖2,a is a Gaussian weighted Euclidean distance whose value is determined by amount of similarity between patches from different neighborhood. Higher the similarity, more will be w(x,x'). This makes patch as standard square patch of size of pxp and the distance being measured as Euclidean norm. where S defines shape of Kth estimator. The second concern is dealt with statistical method of exponentially weighted aggregation (EWA) , where several estimators are combined using weighted average, giving higher weights to estimators with low risks. Ultrasound images were taken from a healthy shoulder of ten different volunteers after all subjects gave their informed consent before participation and the procedures were approved by the local ethics committee. The experimental setup was designed so as to acquire best possible image with maximum comfort of subject. Figure 1 provides the setup configuaration. Despeckling was done using anisotropic diffusion and nonlocal means algorithm. For rigorous study, 70 different images from ten subjects were involved and quantitative parameters were recorded for each image to establish concrete foundation for results. In anisotropic method, the function used for denoising is taken from Eq. 5, and number of iterations was set to 10. In the NLM method, square patches were taken and weight is calculated using Euclidean distance formula introduced in Eq. (14). where, M is the peak pixel amplitude, x represents pixel amplitude in the original image, and x^ is the corresponding pixel in reconstructed image. The greater the PSNR better is the result. MSE is measure of error between the filtered or denoised image and original image. The greater the value poorer is the result. where, I(x,y) is the original image and I^(x,y) is the denoised image and MN is the size of image. where, μ is the mean calculated over the resultant image taken into consideration and σ is the standard deviation of the image. Figure 2 shows the original image in first column, followed by same image processed using anisotropic diffusion in second column and non-local means algorithm in the third column. From Figure 2, it can be seen that, anisotropic diffusion gives the smoother image with 10 iterations which on increasing number of iteration becomes blurry and loose important details for diagnosis, on the other hand nonlocal means technique preserves the important details in image at same time maintaining sharpness in image resulting in better contrast. In image 1, having a closer look provides necessary interpretation about two techniques discussed. Yellow arrow, indicated in both processed image shows blurriness at edges in anisotropic diffusion method whereas sharpness using nonlocal means method, red arrow shown in homogeneous region gives details about the smooth structure inside the healthy tendon of a subject which is more prominent and sharp after using nonlocal means method. The visual results from all images considered are in compliance with . The blurriness in the image processed by anisotropic diffusion increases as we increase the number of iterations, which makes homogeneous regions smooth at the same time hides important details. NLM algorithm takes into account redundancy in the patches and iterations are not required for smoothing, therefore the smoothing of homogeneous regions and sharpness in edges, the better patches and weight calculation leads to more optimum results. The PSNR, SNR and RMSE values obtained for the ultrasound image despeckling using the anisotropic diffusion and nonlocal means algorithm are shown in Table 1. It can be seen that the average PSNR value for non-local means method is 35.2844 whereas for anisotropic diffusion it is computed as 32.8985 which is well below NLM method. Also, the computed average RMSE value for NLM method is 0.1721 whereas that for anisotropic diffusion method is 0.2279. The SNR value computed for every image shows significant increase in the signal to noise ratio in case of NLM method as compared to anisotropic Diffusion. Taking into account the statistical relevance provided by all three measurement metric of anisotropic diffusion and its compliance with visual interpretation, it is clear that NLM algorithm performs well for ultrasound images as compared to anisotropic diffusion method. The trend for the variation in values of PSNR, SNR and RMSE is also shown in graphical form in Figure 3 for better understanding. In Figure 3, it can be clearly seen that values for PSNR and SNR is greater for every image in NLM method than for anisotropic diffusion method, and value for root mean square error is smaller for every image for NLM method compared to that for anisotropic diffusion method. In general, it can be deduced that the results obtained are in compliance with the analytical discussion as well as in accordance with . Further work in direction of qualitative analysis will be carried out in future taking into account necessity and needs of medical practitioners. The findings from the study on anisotropic diffusion and NLM methods, it can be concluded that NLM method is superior and yields better results for ultrasound image despeckling both qualitatively and quantitatively. Further work involving radiologist and clinicians will be carried out to validate results qualitatively and focus on enhancing the NLM algorithm with various variants so as to provide more accurate results for better diagnosis and understanding. The authors would like to thank UTP for their assistance and Ministry of Science, Technology and Innovation for sponsoring the project under the E-Science Grant Scheme: E-Science-03-02-02-SF0109. J. W. Goodman, “Statistical properties of laser speckle patterns,” in Laser Speckle and Related Phenomena. J. C. Dainty, Ed. Berlin: Springer-Verlag, pp. 9–77 (1977). A. K. Jain, “Fundamental of Digital Image Processing,” Englewood Cliffs, NJ: Prentice-Hall (1989). T. Loupas, W. N. Mcdicken, and P. L. Allan, “An adaptive weighted median filter for speckle suppression in medicalultrasonic images,” IEEE Trans. Circuits Syst., vol.36, pp. 129-135, Jan. (1989). D. T. Kuan, A. A. Sawchuk, T. C. Strand, and P. Chavel. “Adaptive restoration of images with speckle.” IEEE Trans. ASSP. vol.35, no.3, pp. 373-383, March (1987). J. S. Lee, “Redefined filtering of image noise using local statistics.'' Journal of Computer Graphic and Image Processing. vol.15, pp. 380-389, March (1987). V. S. Frost, J. A. Stiles, K. S. Shanmugam and J. C. Holtzman, “A model for radar images and its application for adaptive digital filtering of multiplicative noise.” IEEE Transactions on pattern analysis and machine intelligence, vol.4, No.2, pp. 157-165 (1982). R. K. Mukkavilli, J. S. Sahambi, Bora, P. K. “Modified homomorphic wavelet based despeckling of medical Ultrasound images.” IEEE CCEC, 000887–000890, July 2008. A. Pizurica, W. Philips, and I. Lemahieu, et al, “A versatile wavelet domain noise filtration technique for medical imaging,” IEEE Trans. On Med. Imaging, vol.22, no.3, pp. 323-331, Mar. (2003). D. Lai, N. Rao, C. H. Kuo, S. Bhatt, V. Dogra, “An ultrasound image despeckling method using independent component analysis,” IEEE ISBI, pp. 658–661, Aug. (2009). 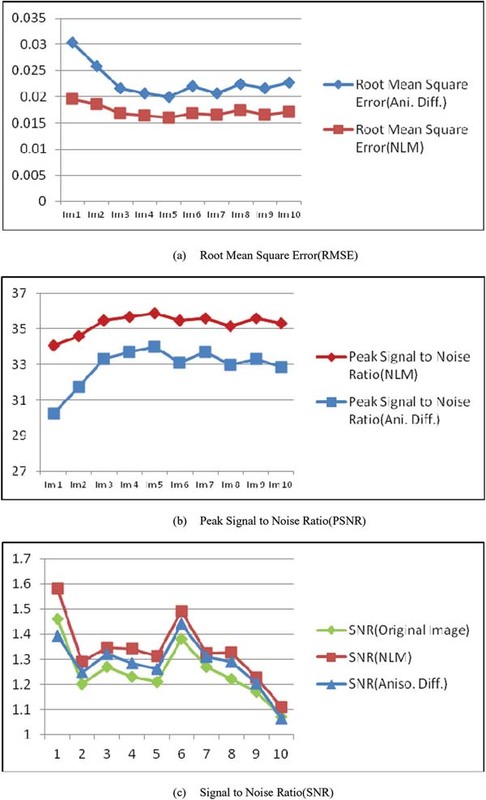 L. Wang, L. Xiao, L. Huang, Z. Wei “Nonlocal total variation based speckle noise removal method for ultrasound image” 978-1-4244-9306-7, International congress on Image and Signal Processing. (2011). M. N. Kohan, H. Behnam “Denoising Medical Images using Calculus of Variations” J Med Signals Sens., 1(3): 184-190, Jul-Sep; (2011). R. Gupta, I. Elamvazuthi and P. Vasant. “Musculoskeletal Ultrasound image Denoising using Daubechies Wavelets”, Global Conference on Power Control and Optimization, PCO Global August (2012). P. Perona, J. Malik. “Scale space and edge detection using anisotropic diffusion.” IEEE Transaction Pattern Analysis Machine Intell. 12 629-639 (1990). X. Zhi, T. Wang “An Anisotropic Diffusion Filter for Ultrasonic Speckle Reduction”. Fifth IEEE international conference on Visual information engg., VIE., 327–330 (2008). Y. Yu and S. Acton, “Speckle reducing anisotropic diffusion”, IEEE Trans. Image Process., vol.11, pp. 1260-1270, Nov. (2002). A. Buades, B. Coll, and J. M. Morel, “A non-local algorithm for image denoising,” in Computer Vision and Pattern Recognition, 2005. CVPR 2005. IEEE Computer Society Conference on, vol.2, pp. 60-65 (2005). W. Chen, M. Ding, Y. Miao, L. Luo, “Ultrasound image denoising with multi-shape patches aggregation based non-local means,” IEEE ICBMI, pp. 14–17, Dec. (2011). O. V. Michailovich, and A. Tannenbaum, “Despeckling of medical ultrasound images,” IEEE Trans. on Ultrason., Ferroelect., Freq. Contr., vol.53, no. 1, pp. 64-78, Jan. (2006). S. Kalaivani Narayanan and R. S. D. Wahidabanu “A View on Despeckling in Ultrasound Imaging”, International Journal of Signal Processing, Image Processing and Pattern Recognition Vol.2, No.3, September (2009). S. Yan, J. Yuan, M. Liu, and C. Hou, “Speckle Noise Reduction of Ultrasound Images Based on an Undecimated Wavelet Packet Transform Domain Nonhomomorphic Filtering,” IEEE 978-1-4244-4134, Oct (2009). S. Gupta, RC Chauhan, SC. Saxena, “Robust non-homomorphic approach for speckle reduction in medical ultrasound images”, Med Biol Eng Comput. 43(2):189-95, Mar. (2005). V. Dutt and J. F. Greenleaf, Ultrasound echo envelope analysis using a homodyned K distribution signal model,” Ultrason. Imag., vol.16, pp. 265-287 (1994). R. C. Molthen, P. M. Shankar, and J. M. Reid, Characterization of ultrasonic B-scans using non-Rayleigh statistics,” Ultrasound Med. Biol., vol.21, no. 2, pp. 161-170 (1995). V. M. Narayanan, P. M. Shankar, and J. M. Reid, Non-Rayleigh statistics of ultrasonic back scattered signals,” IEEE Trans. Ultrason., Ferroelect., Freq. Contr., vol.41, no. 6, pp. 845-852, Nov. (1994). P. M. Shankar, V. A. Dumane, J. M. Reid, V. Genis, F. Forsberg, C. W. Piccoli, and B. B. Goldberg, Classication of Ultrasonic B-Mode Images of Breast Masses Using Nakagami Distribution IEEE Transactions on ultrasonics, ferroelectrics, and frequency control, vol.48, no. 2, March (2001). D. V. D. Ville and M. Kocher, “SURE-Based Non-Local Means,” Signal Processing Letters, IEEE, vol.16, pp. 973-976 (2009). A. Dalalyan and A. B. Tsybakov, “Aggregation by exponential weighting, sharp PAC-Bayesian bounds and sparsity,” Mach. Learn., vol.72, pp. 39-61 (2008). Rishu Gupta was born in Gonda, UP, India, in 1984. He received his B. Tech degree in Electronics and Communications Engineering from Bundelkhand Institute of Engineering and Technology in 2009 and M.S degree in Visual Contents from Dongseo University, South Korea. Currently, he is working toward the PhD Degree from UniversitiTeknologiPetronas, Malaysia. He is active IEEE student member since 2012. His research interests include medical ultrasound image processing and Visual Contents. I. Elamvazuthi obtained his PhD from the Department of Automatic Control and Systems Engineering, University of Sheffield, UK in 2002. Dr. I. Elamvazuthi is an Associate Professor at the Department of Electrical and Electronic Engineering of UniversitiTeknologi PETRONAS, Malaysia. He is a member of IEEE, IFAC, AEE, AAIA and BEM. His research interests include Control and Systems Engineering with focus on energy (power systems), robotics and bio-medical applications. Ibrahima Faye is an Associate Professor at UniversitiTeknologi PETRONAS, Tronoh, Malaysia. He is attached to the Department of Fundamental and Applied Sciences and the Centre for Intelligent Signal and Imaging Research. He received a BSc, MSc and PhD in Mathematics from University of Toulouse and a MS in Engineering of Medical and Bio-technological data from EcoleCentrale Paris. His research interests include Engineering Mathematics, Signal and Image Processing, Pattern Recognition, and Dynamical Systems. P. Vasant is a senior lecturer in the Department of Fundamental and Applied Sciences, UniversitiTeknologi PETRONAS (UTP),Malaysia. His research interests are Hybrid optimization, Soft computing and Computational intelligence. Professor Dr JGeorge is Head of Musculoskeletal Radiology at the Department of Biomedical Imaging, University of Malaya Medical Centre in Kuala Lumpur, Malaysia. He has spoken at several International Conferences and runs annual Musculoskeletal MRI and ultrasound workshops in Penang Island. He has authored about 35 ISI cited publications and his research interests are in menisco-capsular tears of the knee, knee cartilage imaging and classification, MRI for age estimation used by FIFA and use of High Resolution of Ultrasound for arthritis screening.